In Florida’s excruciating afternoon heat, the cross country teams took to the Lakeland course of the Flrunners.com Invitational race. Having raced in Lakeland at the beginning of the month, the Tars saw the perfect opportunity to measure their progress. In the first evening race of the season, both Jack Gabriel (‘20) and Katie Rioux (‘19) emphasized the grueling conditions, as the heat index hovered around 100 degrees at start time. In spite of weather, everything turned out for the best. After racing side by side for the duration of the meet, Gabriel and Ryan King (‘21) suddenly decided to make matters entertaining with a sprint finish, and a last breath kick helped Gabriel edge King by less than a second. “That’s always fun to do. His watch got us going at 19 mph, I clocked us at 20 mph for the final sprint,” said Gabriel. Why would they sprint at the end of an 8km race? “Most likely because I said winner could choose where we stopped for dinner on the way home,” Coach Nate Weyant said. Weyant was satisfied with the race meet. “Both guys [Gabriel and King] are doing fantastic this season. It was also good to see Eric [Grimm] (‘21) get his first action and have Aaron [Villanueva] (‘20) post a solid time,” he said. Gabriel clocked 33:20.91, King 33:21, Grimm 40:47, and Aaron Villanueva 43:45. They placed 24th, 25th, 35th, and 36th, respectively. The women’s team’s success was also cause for celebration. “Sinead continues to lead us, and once we get race strategy figured out, her times will come down immensely… I was also happy with Alex Lichtner’s (‘21) performance. She was nearly six minutes faster this week than early September when we ran at the same place. All in all, it was a great race,” said Weyant. In the women’s race, McDonald led the way with 24:40, coming 37th; followed by Meg Bespolka (‘20) in 46th with 27:23, which just edged out Aby Wong (‘19) at 27:24. 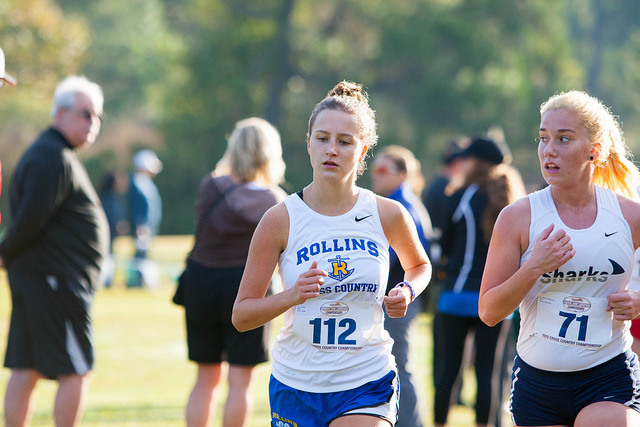 The times for the rest of the Rollins women were 28:57 for Lichtner, 29:30 for Rioux, and 29:36 for Anna Belle Warren (‘22). According to Gabriel, attending practice is something that can be improved upon: “For the most part, we do offer practices both in the morning and in the evening.” After all, not everybody wants to get up at 5 a.m. to run, and Gabriel said that is “understandable,” yet he called for consistency. “I think that would help make everyone faster,” he said. The men gave a great performance, but the absence of a fifth member meant they could not score as a team. Had there been a fifth runner, the men’s team would have scored its best ranking during Gabriel’s time in Rollins. With only two meets left before conference, she called for vigilance. “We should all be working to trim down our race pace and establish that muscle memory… In addition to speeding up our times I think we will all need to be extra cautious of injury and making sure things are taken care of sooner rather than later,” said McDonald. The Tars are marching on: “We’re keeping our team comradery. We spend a lot of time together, talk about runs, and have kept up the spirit of actually being a team,” said Rioux. Coach Weyant was full of praise. “Everyone seems to be getting along very well and pushing each other in training. It is an absolute pleasure to coach this group. They are all great representatives of Rollins Athletics both in and out of competition,” he said.